OK, we've had some Life:Interrupted this week. I've been distracted. We had a great weekend, just being "family". I just don't have any super money advice today. I'm not money-inspired...or something. But you know, I did do something this weekend that is...sort of money-saving related... So, I'll just show you that, instead. Don't judge anything by it's cover. See the potential. 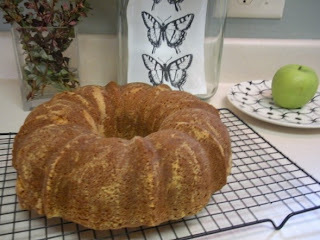 Case in point: My Bundt. I can't pronounce that without saying it like the mother in My Big Fat Greek Wedding. Go ahead and pronounce it like that with me for the duration of my post. 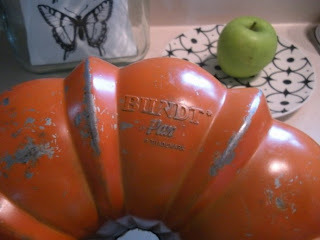 I found my Bundt on a dusty shelf in a dingy consignment shop that kinda smelled funny. But, oh, I found some treasures there. This is one of them. She was clearly at least thirty years old. She had scratches inside and out and had seen her share of picnics and holidays, for sure. But I'd really been wanting one, and here she was. Past her prime, but, maybe she was ready for a comeback. And I must say, I was highly attracted to her vintage-ness, and I have a big heart for taking castaways under my wing. She was also $2. New ones are about $30. Ca-ching. 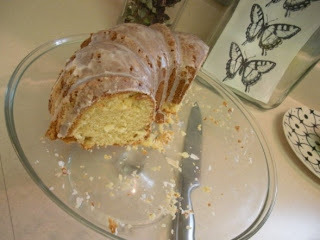 Spur of the moment on Saturday, I made my batter, coated my Bundt, and wished and hoped for the best. Clearly, this was no modern nonstick surface, you know what I'm sayin'? Would you believe, it worked? Lovely. my family, who devoured it. Yep, that's after one sitting. Oh, baby, it was divine. 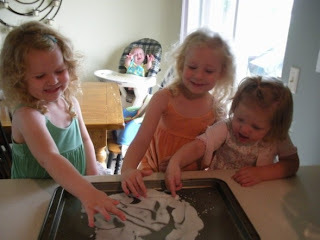 See Hudson screaming and grasping in the background, forced to watch while his sisters ate the leftover frosting? 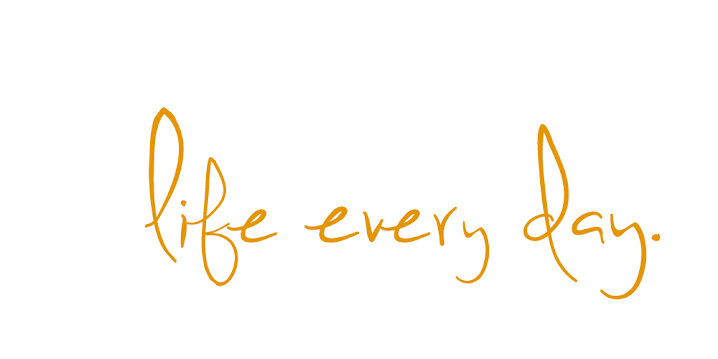 I love that you make me laugh each day! 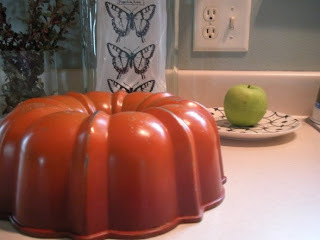 That Vintage-ness Bundt cake pan is so rockin' I love it! Oh that last picture is so funny... poor Jack and Hudson would have a lot to commiserate about. I'm totally a vintage junky as well. I love "re-claiming" stuff - we hardley paid for any of the furniture in our flat, and what we did pay for cost us pence rather than pounds! It's just that stuff that's been pre-owned is so much nicer! I feel for ya, Hudson!! I'm even further away than you!!! Yummy! 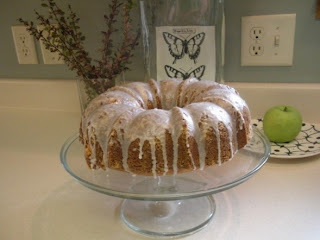 I have a bundt pan too - only mine is the non-vintage kind that doesn't have near the style....or the super duper price. PS - award for you over at my place! What a good bargain.... and I love the pictures.....you have inspired me to get out my old bundt pan from the back of the shelf and put it to work.....it probably feels neglected. Cute pictures of your darling girls getting the last drop of frosting. that is a beauty of a bundt pan friend!! I've been looking for a Bundt pan. Its so funny because I immediately thought of My Big Fat Greek Wedding when I saw the word BUNDT. Love that movie:) Your cake looks really good! My Bundt pan is blue and I got mine at a place called Carousel Consignments for a mere $1.00 about 5 years ago. Isn't it interesting how they can make an ordinary cake [not calling YOURS ordinary] look extra-special?! Whenever I make a cake in mine, my youngest usually says, "Who's coming over?"